American spirits have a rich and often colorful history, but it can be tricky separating the actual truth from the legends. One of the more curious pieces of lore that you’ll often hear along the bourbon trail is that prohibition, and more accurately bootleggers, were the origin behind NASCAR. It’s the kind of story people want to believe in, but it seems a little too perfect. Just imagine: a good old boy from Kentucky wants to make a little extra money to get by, so he sets up a still, tucked away in the woods and far from town. In order to sell what he distills, he’s got to get it from his operation to the buyer. So he loads up his car and hopes for the best, right? Not quite. He’s not taking any chances; that’s why he picks out an unassuming jalopy that’s unlikely to draw the attention of the authorities. Next, he installs the most powerful engine on the market under the hood of his car and squeezes out every little bit of horsepower he can through fine tuning, upgrading and constant maintenance. If you outran the cops back then—congratulations! You got away! It’s not like they could call in a police chopper. Luckily, bootlegging provided an excellent source of income to support this new need for high-end car parts. So historically, it makes a lot of sense. You have a handful of bootleggers with deceptively souped-up cars careening around narrow, winding country roads, outrunning the law and racing each other for fun—all at break-neck speeds. 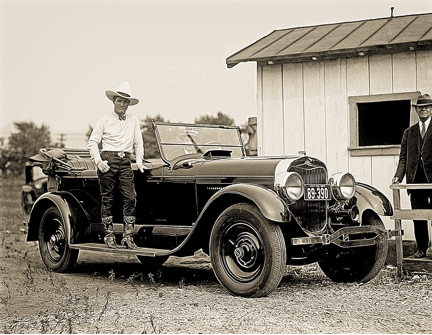 Even after prohibition ended, bootlegging didn’t, and the cars just kept getting faster. So our verdict: fact. Sometimes a perfect story is just that. While there will always be people obsessed with fast cars, bootlegging clearly had a direct influence on the unique culture of stock car racing, making it a uniquely American pastime.